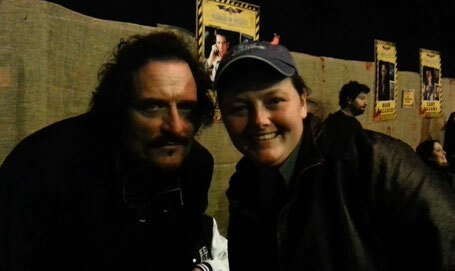 Kim Coates is the first actor we met. In "Gaiazoo started it all" you already read how the convention madness started. (If not shame on you...) Where Gaiazoo was the start of everything, Kim Coates was the one who gave us a (huge) nudge in the right direction. If it wasn't for him, I don't know if we would ever dared to go to a convention again! It was in the times that I was still naive. I had no clue in how conventions worked and what to expect. I went in so open minded. It makes me laugh just to think about it. First of all: Who is Kim Coates? Kim was born in Saskatoon, (Saskatchewan, Canada) on February 21, 1958. He is mostly known for his role of Alexander "Tig" Trager in "Sons of Anarchy. He is also known for his role of Sgt. Tim "Griz" Martin in the award winning Ridley Scott film "Black Hawk Down". (Great movie btw). But besides these roles he played in a lot of movies and tv shows (for example: Prison Break, CSI: Miami, Battlefield Earth, Pearl Harbor, Waterworld, Resident Evil: Afterlife, The Last Boyscout and Silent Hill). He also worked on Broadway ("A Streetcar Named Desire") and he played the lead role in MacBeth at the legendary Stratford Theatre. 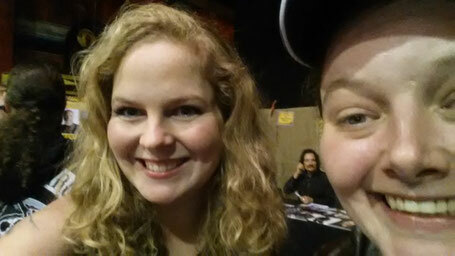 I was so excited to see Kim Coates! I love Sons of Anarchy where he plays the role of Tig. Tig is a greatly developed character. He has so many different sides. Tig is loveable and scary at the same time. Yes Tig is a great character. He is very violent and obviously has some serious psychological problems, but he is also very loveable and very loyal. He also shows sensitivity when it comes to women and animals. At Weekend of Horrors we ran around like crazy. Staring at the actors, going to a Q&A, go back staring at the actors. Well.. Maybe another Q&A. Lol I guess we must have looked like two weirdos and I would like to take this moment to express my sincere apologies for scaring you. I remember Kim Coates and Robert Lasardo mostly. We were so excited to see them, but at the same time intimidated. They both have this look.. When I got there, I just felt like we would look at all of them. But not that they would actually notice us too (Yeah, I warned you: Naive!). But when they looked, I tended to run away and scream sorry, sorry and go sit in a corner. Though they both turned out to be extremely nice! Again our sincere apologies for this! No chance, that I would go for an autograph. No way. Just the thought, of actually having to say something. So we kept a distance and made a million pictures (Still thinking nobody was noticing us).As the day progressed we decided it was enough. Our motto became (and still is): Throw away all the shame. And: Let's do this!! We pushed eachother's adrenaline levels to new heights and walked around like two teenagers at a Justin Bieber concert. Yeah, it resulted in some 'awesome' selfies. Mainly to laugh about afterwards, I love how excited I was. Do you see the tiny Kim in the selfie here? And do you see how he sees us, lol? We started making pictures, selfies, even getting a bit closer. And we talked about going one step further.. Would we actually dare to speak to Kim? Yes we were going to! Walking towards him we decided maybe not. This is too awkward. But.. we might never see him again. It would be so cool! So.. we did it!! (Oh, I'm so proud!). I remember walking towards him (Scared as hell). And he was the nicest guy ever! He gave us a big smile and started a conversation. He was so interested. He asked me questions about Sons of Anarchy, episodes I've seen and scenes he played in. It was a great conversation and while I stood there, I just couldn't believe this was really happening. 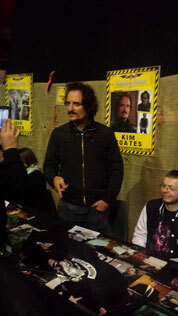 A few weeks ago I didn't even know that conventions existed, and now I was here talking to KIM COATES!! And then I got an autograph. I loved it. Liv and I were filming each other during our conversations and were so excited! And Kim immediately said we could take a picture too. He has no idea how happy he made us that day. We were over the moon. It litteraly cost us all our courage just to walk towards him. And it couldn't have gone any better. I'm so glad that Kim was the first I met. He was incredibly kind and couldn't image a better first autograph! Even now we're used to conventions more and go quite often, Kim is still of the nicest actors I've met! He sure is! He was absolutely fabulous! I picked a picture of Black Hawk Down because I loved that movie and I hadn't seen an episode of SOA yet...actually I was planning to begin watching it for a while, but meeting Kim was the final push I needed. Nowadays it's one of my favourite shows. But back to Kim. I remember I was very nervous when we walked up to him, but they were gone the moment I shook his hand. He made me feel very relaxed and he talked about how he loved my name. Mr. Coates it was a great pleasure to meet you! Love Sons of Anarchy? We also met David Labrava and Mark Boone Junior. Check out what we thought about meeting them! You have to give yourselves credit. It did take you two a long time to get your act together and while it was slow, lookie... YOU TALKED TO MR. COATES HIMSELF!!! Attagirls! It must have been really ecstatic for you. I have also wondered how I would react when I see my favorite TV star. I haven't watched SOA but I've heard of it. I'm so happy for you! WOW so exciting! I do not know much about Kim Coates and I have never watched Sons of Anarchy but if you are a fan then this must have been spectacular. I know he is friends with William Fichtner who I adore! I am so excited for you, and him being down-to-earth must have made the whole experience even better. Now that was an accomplishment! Congratulations. I haven't really seen Sons of Anarchy but I know the feeling of someone who is a fanatic of some show/movie. I would also dare and try to get closer to that person and get a photo, talk to them and have an autograph as well. Great job on the video too. You're so lucky to have a chance to meet your favorite tv star. How I wish I can also meet my tv idols in person!! TBH I really don't know this actor but it was fun reading your experience when you met him. I'd probably do the same if my favorite actor was involved. 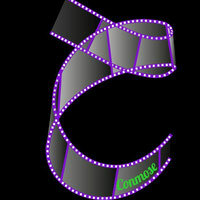 Finally I have found some good blog about Kim Coates, they are so rare without quality information, somehow empty. Your blog puts new light on Kim. I didn't watched Sons of Anarchy but enjoyed his acting in Resident Evil: Afterlife. You must be trilled with what happen. 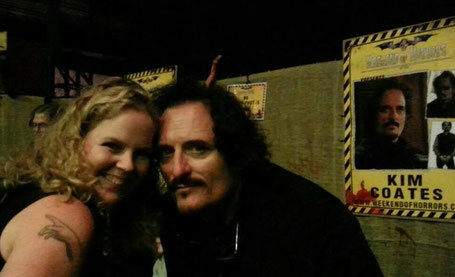 Imagine up close and personal with Kim Coates! I envy you, as for me, I can only see him on his movies. Wow , what a great opportunity the actors are giving their fans and how kind of them is this . I don't know the serie , and don't know any of these characters. But what a remarkable experience for you . Brilliant post ! Yay for you! 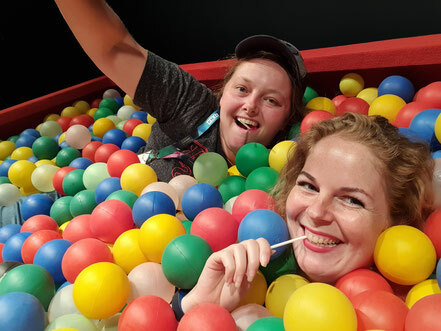 Looks like you had so much fun. Not really that super familiar with Sons of Anarchy but have heard of it before. It is great that the cast reached out to fans. Great way to thank fans for the support. Eeek, I need to up my tv game. I haven't seen any of his shows but I have seen him in Black Hawk Down, Pearl Harbor and Waterworld. Great pics btw. Congrats on meeting one of your favourite actors! Your motto paid off . "Throw away all the shame. And: Let's do this!!" is a good one to live by! I am sooo happy because you met your favorite actor. I am glad that you have amzing time and I am really happy because of you! You just deserve it! meeting your idol cant be replaced with anything else. happy for you, great post and great photos.. I have no idea who is he, but I am so happy for you! I am really glad you met him! Wow, Sons of Anarchy is major here in the states. I can't wait to hear more of your convention stories. It must've been exciting. I remember when I lived in Rotterdam, I would always get excited when celebrities came out to do concerts, because nothing exciting ever happened...But then when it did.....Awesome sauce. Great post. Glad all the celebs were so nice. I love sons of anarchy! What an amazing moment it would have been for you. I have never heard of him but it seems you gad a great time meeting him. Hey, I can understand your enthusiasm. Nice article, It clearly reflects your awesome nature and some nice selfies as well. Sorry, I am not aware of the Movie and the mentioned actor.